Austin Improv • View topic - THE PROFESSOR, Doctor Who style improv, debuts TONIGHT! 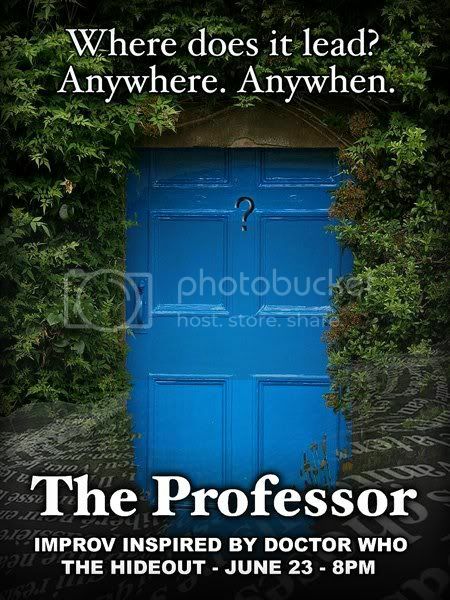 THE PROFESSOR, Doctor Who style improv, debuts TONIGHT! Tonight in the Thursday Night Threefer at 8pm at the Hideout, THE PROFESSOR will take the stage and attempt to answer these questions and more (or, failing that, try to tell you a fun story besides. ) in an improvised tale inspired by and in the style of Doctor Who! Just three bucks gets you a seat for this, Rachel and Dave and Your Dad's Friends! NOTE: The Hideout is not responsible for providing a couch for you to hide behind. You have been warned. first show was fanTAStic! second show got a bit convoluted, but still pretty good. both revealed things to work on, so hopefully next time that blue door shows up things will be even better!